If this software does not work for you then Boachsoft doesn't deserve your money. This is the best deal ever! Are you looking for an excellent and easy to use or simple dvd rental software which is also a point-of-sale (POS) system? You have come to the right place. Boachsoft SmartManager is an advanced Windows based video rental software. This software is very easy to use, inexpensive and user friendly. A robust and proven solution with hundreds of users worldwide this video rental software has all you need to manage your video rental business. One advantage of this desktop movie rental and point of sale software is that in the networked version you can have several terminals sharing a single database. You can even hook it up to your website. Who should use Boachsoft Smartmanager? Boachsoft's smartmanager is designed for managers of video rental or dvd rental businesses who want to manage their businesses with ease while enhancing productivity. If you are looking for a dvd, video, cd or game rental software with excellent reports, a good customer accounts tracking system, a handy reservation system which would also enable you to sell and track products then Boachsoft Smartmanager is definitely the right one. If you are already using another software like game rental software you can easily migrate using our data import wizard. A Networked (Client/Server) version of this software is also available. Below is a summary of the features of Boachsoft Smartmanager. The rest of the features can be found on the features page. Now you can rent out items for up to 365 days. No longer limited to 7 days. Lookup movie details with a click of a button. Track DVDs with multiple titles easily. Advanced and easy to use transaction processing system. An excellent customer accounts tracking system. Full point-of-sales module- Pole display, cash drawer etc. 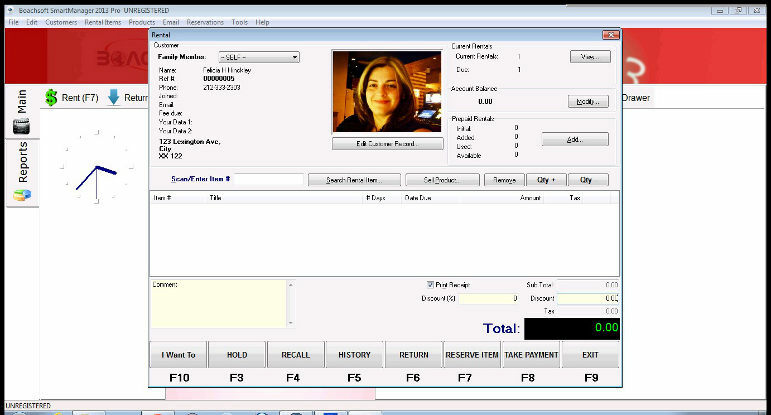 Generate barcodes for you rental items with ease from this video store software. Capture customer photos right from this software. Automatically send Emails right from this software to your customers. Send overdue rental reminder email, account status emails, birthday offer emails as well as your custom emails right from this client. With our database system maximum database size is only limited by system resources. You don't have to worry about maximum database size. Create in this software special offers like rent x items for y dollars, rent x items get y items free and several others. Export your reports to pdf, html or rich-text-format. DVD rental software must be user friendly and this is very user friendly. Report on best performing rental items in Inventory. Graphical analysis of rentals and sales.